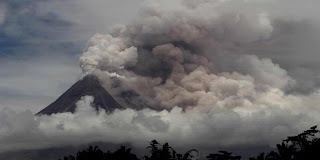 Mount Merapi has not finished shedding magmanya, Krakatoa is showing signs of increased activity. A mountain with another mountain as if one after another and not to be outdone active. However, did you know that some mountain abroad also shows something similar? Here is a report on the mountains in the world are experiencing an increase in activity. The report comes from John's site search algorithm (http://www.volcanolive.com), a member of the International Association of Vulcanology and Chemistry of the Earth's Interior (IAVCEI), who has traveled to 180 mountain for 22 years of his life. The mountain is experiencing explosive and effusive eruptions over the last week, especially on 22-25 October and 27 October 2010. Additionally, this mountain also issued a volcanic ash that reached 26,200 up to 29,500 feet high. Volcanic ash also spread to a radius of 2300 km to the east of the mountain. The mountain is also experiencing explosive and effusive eruptions over the last week. On October 28, 2010, it issued a mountain of volcanic ash that reached 23,000 feet high. Satellite imagery shows that the volcanic ash spread to a radius of 2500 km to the east of the mountain. Ash rain occurred in the Ust-Kamchatsk so that the local airport to be closed. Increased volcanic activity occurred on October 27, 2010. Increased seismic activity and tectonic earthquake occurred a few times. Eruptions also occurred on that day at the southeast side of the mountain. Some volcanic earthquakes have occurred since October 31, 2010. Floods caused by ice that covers the mountain also increased. About 130 cubic meters of water flowing each second flooding the area around the mountain. Volcanic earthquake activity increased from 20 times per day to 35 times per day on Friday, October 29, 2010. Volcanic ash is also seen higher, up to 1 kilometer.